Go to the WCG website and download the version you need. Since most people use Windows, that will be covered first. Downloads and installation instructions can be found here. 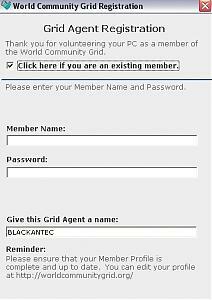 After you have installed the program, go to your "My Grid" page here. There you select from the column on the left, and change your Profile, Projects, and Preferences on how the program runs. Most important is to click on Device Manager, and it will show your device. Where it says "selected profile", click on "default". Once there, you can change when and how the program runs on your machine. To join the AOA Forums team, go to this page and clcik on "join this team". On that page you will see some team stats. Scroll down to where it says Team Member Details and Statistics and click on Points Generated, and it will give you list of members and stats. I think that stats update every 6 hours or so, but I'd have to double check. 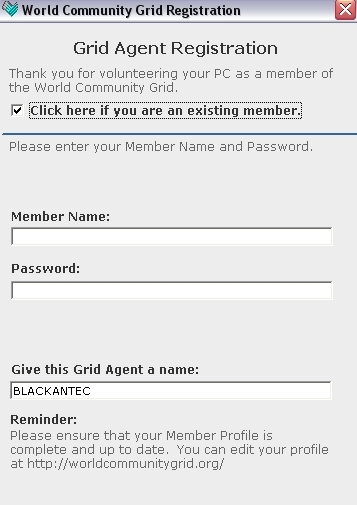 Remember to replace YOUR_WCG_USER_NAME with your actual user name on the World Community Grid. That's all there is to it! Last edited by Gizmo; 16th March, 2006 at 05:38 PM. 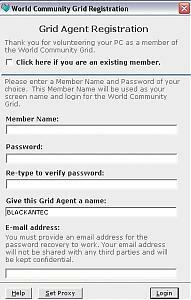 A few images to show what the registration screen looks like for new and existing members. 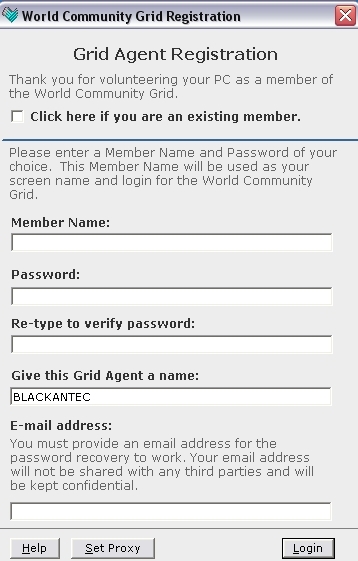 You can click on the "check mark" on the bottom of the program window and it gives a option to "run as screensaver only", along with some links to other WCG options and pages. An image of what one of the running programs looks like. The program does set it's self up run as your screensaver by default, so if you don't want it run as screensaver, you'll need to change that in your Display Properties. Sorry if this question is answered in the docs, as I haven't looked yet, but can I run it as a service? I'm not sure. I'll see what I find out. I find this rather interesting, but what is it actually for? I'm on. What about sigs? Is there going to be one like the Folding@Home one? UNAIDS, the Joint United Nations Program on HIV/AIDS, estimated that in 2004 there were more than 40 million people around the world living with HIV, the Human Immunodeficiency Virus. The virus has affected the lives of men, women and children all over the world. Currently, there is no cure in sight, only treatment with a variety of drugs. Prof. Arthur J. Olson's laboratory at The Scripps Research Institute (TSRI) is studying computational ways to design new anti-HIV drugs based on molecular structure. It has been demonstrated repeatedly that the function of a molecule — a substance made up of many atoms — is related to its three-dimensional shape. Olson's target is HIV protease ("pro-tee-ace"), a key molecular machine of the virus that when blocked stops the virus from maturing. These blockers, known as "protease inhibitors", are thus a way of avoiding the onset of AIDS and prolonging life. The Olson Laboratory is using computational methods to identify new candidate drugs that have the right shape and chemical characteristics to block HIV protease. This general approach is called "Structure-Based Drug Design", and according to the National Institutes of Health's National Institute of General Medical Sciences, it has already had a dramatic effect on the lives of people living with AIDS. Even more challenging, HIV is a "sloppy copier," so it is constantly evolving new variants, some of which are resistant to current drugs. It is therefore vital that scientists continue their search for new and better drugs to combat this moving target. Scientists are able to determine by experiment the shapes of a protein and of a drug separately, but not always for the two together. If scientists knew how a drug molecule fit inside the active site of its target protein, chemists could see how they could design even better drugs that would be more potent than existing drugs. To address these challenges, World Community Grid's FightAIDS@Home project runs a software program called AutoDock developed in Prof. Olson's laboratory. 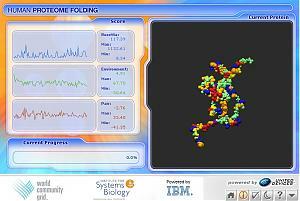 AutoDock is a suite of tools that predicts how small molecules, such as drug candidates, might bind or "dock" to a receptor of known 3D structure. The very first version of AutoDock was written in the Olson Laboratory in 1990 by Dr. David S. Goodsell, while newer versions, developed by Dr. Garrett M. Morris, have been released which add new scientific understanding and strategies to AutoDock, making it computationally more robust, faster, and easier for other scientists to use. 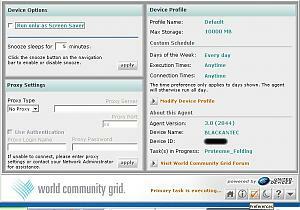 AutoDock is used on the World Community Grid to dock large numbers of different small molecules to HIV protease, so the best molecules can be found computationally, selected and tested in the laboratory for efficacy against the virus, HIV. By joining forces together, The Scripps Research Institute, World Community Grid and its growing volunteer force can find better treatments much faster than ever before. According to this thread at the WCG forum, you can. The info can be found here. Please note that is from an unofficial site, and I haven't had a chance to check it out, so use at your own risk. The site does link to the WCG's top ranking team, so it's probably ok. I just don't want to endorse it until I know for sure. 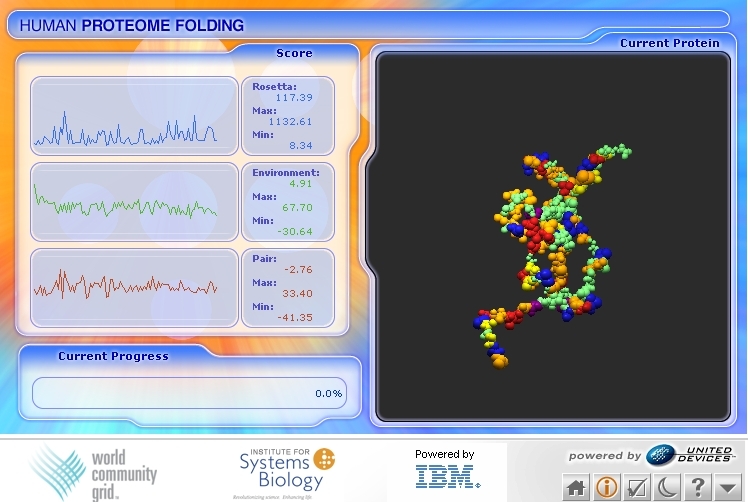 How exactly is the Proteome project different from the Folding@Home project? the folding at home does specifics, while teh wcg is doing EVERYTHING. folding at home does protiens that are known to fold, WCG find the protiens to be folded. same work, different take on it...there's a tonne of info that needs to be processed, and all teh findings are shared, so no matter which project, it all benfits the same in the end. 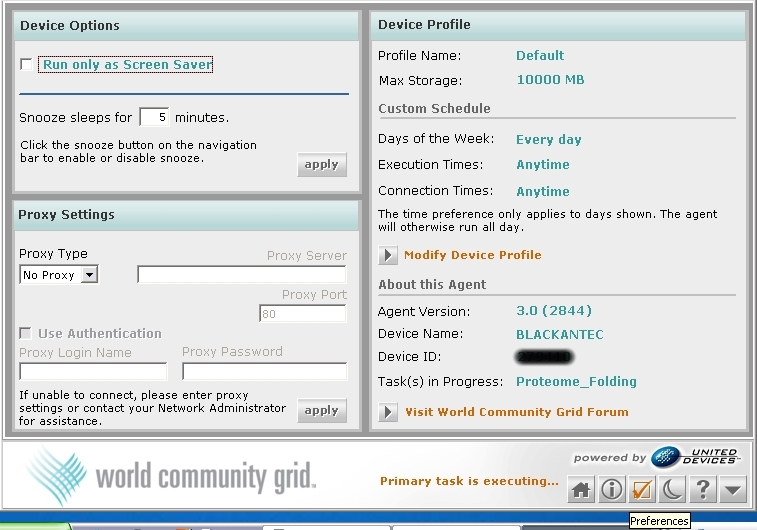 in regards to running it as a service, the boinc client offers this functionality upon installation, and hence my curiousness towards that client. Hi Giz. I believe they use different programs and look at different things, in the Human Proteome. Sorry, I can't be more specific at the moment, but will post a comparison as soon as I can. I believe they are both good projects. They just go about it differently. I will tell you that I run the Boinc version in both Linux and Windows, and it does seem to run faster. Boinc work units are much smaller and finish faster, imo. They convert Boinc points to regular WCG points at the rate of 7 WCG points per 1 Boinc point, and it's all added together for your stats totals. Last edited by LP; 6th January, 2006 at 06:46 PM. LP! You really pull a crowd!